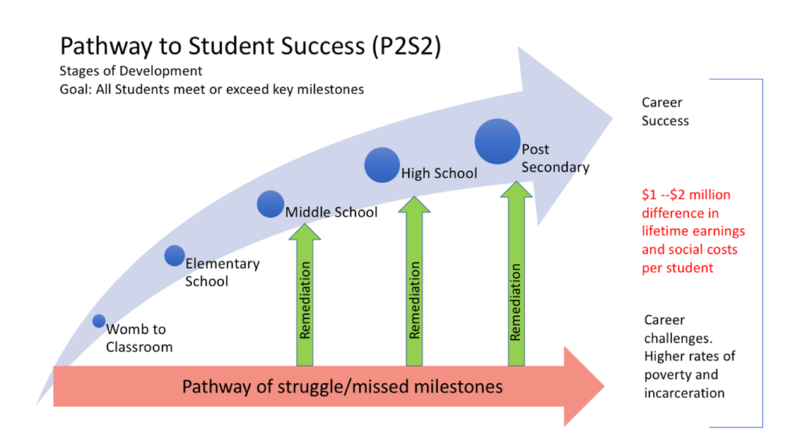 Reading success is achievable for most every student, yet far too many struggle. Whether you are a parent, a community organization, a school, or a student of an age who can take independent action, we can help to improve reading success for you or those you are helping. We can provide information and access to online assessments and training that in most cases can help students to achieve reading success. Our focus is the prevention of reading difficulties. However, the same principles and tools can help students of all ages. The age where we target most of our activities is grades K-2. Most reading difficulties can be prevented; not all, but most. It is important for parents, extended family, and care givers to understand how important it is for a child to be read to aloud daily from womb to classroom and beyond, to be shown printed text when being read to, to be engaged in positive conversations that build a growth mindset, and to engage in play activities that develop critical thinking skills. A child is born with about 70% of the mass of their eventual adult brain and their lifetime supply of neurons. Reading, talking, and playing activities during this stage of life help develop the neural connections that empower a child to become a successful reader and learner. Please don't think that this stage of development is not important, that the school is responsible for teaching a child how to read. Families play a critical role in preparing their child for a lifetime of success. If a child enters kindergarten without the needed foundational language skills such as vocabulary, phonemic awareness, print concepts and syntax, they likely will struggle in schools with the traditional phonics-based instruction. It will be confusing and frustrating. We have teamed with an award-winning online reading program called Reading Kingdom to help catch up students who are behind. The program would help every student, but it is especially important for those who need extra help. Our primary model is to work through schools and nonprofit community organizations to make the program available to first grade students to work on at home. The ideal time to start is the summer before first grade and continue into first grade as needed. The Reading Kingdom approach is much easier for early readers to understand and it builds a stronger foundation for long-term reading success. Once a student completes the program they will be reading at a third grade level. So any student who is below a third grade level can benefit. Our focus is first grade to prevent reading difficulties. Background materials for Reading Kingdom are available under the support tab. The website is http://readingkingdom.com. Reading Kingdom also has a special program for autistic children. That website is http://asdreadingkingdom.com. Schools can begin by only offering the Reading Program to parents for use at home. This helps encourage parent engagement and gives the school a chance to experience the program success before considering any kind of supplemental curriculum change during the school day. We have found that once schools understand the program, they are eager to incorporate Reading Kingdom into the schedule. Students love doing the program and schools see greater gains than with their regular curriculum alone. It is a great supplemental reading tool and is extremely affordable. When compared to a leading online program commonly used in schools it is one tenth the cost per student or less. If a parent would like to access the program, they can visit the Reading Kingdom site and purchase directly. However, if a family cannot afford the retail price of the program, they can help us to get the program into their school. Just go to the contact page and send us an email to begin the discussion. We also provide additional programs for schools, which can also make the online training programs available to parents at home. Through CogRead, we offer schools a variety of early reading skills development tools. We also offer an online cognitive skill assessment tool and training program. These tools can be accessed at home by parents but must be offered through the school or nonprofit community organization. We have also teamed with a program called Let's Go Learn. Their program offers one of the better adaptive assessment tools for reading and math, and also provide an excellent online training program for both subjects for grades K-12. If a student struggles with reading and learning in the 3rd grade and beyond, it is important to understand why. Just adding more of the same instruction is not likely going to solve the problem. Please refer to the section and article about Understanding The Causes of Most Reading Struggles. In most cases, a student who struggles has one or more weak cognitive processing skills and weak foundational reading skills. The first step is to complete a cognitive skill assessment. If a student has any significantly weak cognitive skills, we recommend that the student complete some type of cognitive skill training program. Through schools and nonprofit organizations, we provide access to a very affordable cognitive skill assessment and training. If a parent is not able to work through their school, we can recommend several programs available retail online. We use the same programs described in the previous section, but strongly recommend adding mindset and performance character training, and if possible, mentoring. We work with schools and nonprofit organizations to structure a program to help most every struggling student succeed. Schools can adopt the program and make it available as appropriate so students can train at home if training time cannot be structured in the school schedule. For students who are beyond the age range of Reading Kingdom, we recommend Let's Go Learn. LGL also has an excellent math program. The adult options are identical to the ones outlined above. Parents who have weak reading skills can participate along with their child. Students who have dropped out can better understand why school was so hard for them and recover. Adults who are English Language Learners can benefit from either the Reading Kingdom Program or Let's Go Learn. If they have weak cognitive skills, they can also participate in the cognitive skill training. It is most practical for us to work with a school and local community organization. If you are an individual, please help us connect with a group in your area to begin offering these tools to people in your community.